I used to think I couldn’t change – I was wrong. 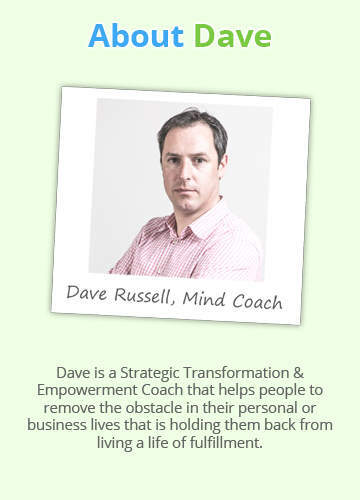 As a former anxiety sufferer and now a Mind Coach, I work with people that want to rid their lives of anxiety. I know first-hand not only what it feels like to have anxiety but also what it feels like to believe that there would be no end to my suffering. My clients and I are living proof that anxiety doesn’t have to be a life sentence. However, on reflection, there were a number of realisations that I had to come to before any change could happen. The following are the 5 most important as I see them. 1. I could control my thoughts. The notion that I could control my own thoughts was quite alien to me. I had a constant negative and paranoid internal monologue going on. I had never been shown how to take control of my thoughts despite all of the years of education that I had received. If it was possible to control my thoughts then surely I would have been shown somewhere along the way, wouldn’t I? So without the skills to control my thoughts I was left with no option, in my mind but to listen to them and remain totally at the mercy of them and believing that each and every negative thought I had was true and to be believed. 2. My anxiety gave me a negative lens through which I viewed the world. In my world the opportunities for stress and self-deprecation were everywhere. Rather than understanding that this was just my perception of the world brought on by my anxiety, I believed this to be the only perspective that I could have on the world. It was the truth. The real truth however, was not that simple. My anxiety created a heightened sensitivity to stressful situations. I would get stressed at things that others would not and believed that the reason that they didn’t was because they didn’t have a full understanding of the situation. This really distorted my world view. When I learned that my anxiety was creating my negative perception of the world I became aware that getting control of my anxiety could reveal a less stressful world. 3. I was not mentally ill. Seeing as I didn’t have a full understanding of what was going on in my mind, I jumped to some conclusions like; there was something seriously wrong with me or, I might have a mental illness. As I learned more and more about my anxiety I began to realise that I wasn’t mentally ill, but rather I had never been given the necessary skills and tools to manage my own mind. In the absence of these skills and tools I was ill equipped to face the stresses that I would encounter as I went through my life. This at least gave me one less thing to be stressed about. For years I was extremely hard on myself. I admonished myself for not being stronger and for not being able to cope with the stresses of modern life. I compared myself to others most of whom never encountered the same levels of stress that I did and I berated myself for not being able to be as calm as them. Thankfully, I came to the realisation that due to many factors in our lives we all have a different tolerance and threshold for stress. Without the necessary awareness and skills to keep myself from breaching my threshold, I was bound to struggle through no fault of my own. That is when I started to give myself a break and stop adding to my stress by being stress about how stressed I was! I used to believe that this was just who I was, it was how I was made and that I would just have to learn to live with it, to deal with it. I was accepting it as my lot in life. I then started to realise that this was one of the things that was stopping me from changing. If I didn’t believe that life could be different and that I could change, why would I work hard to find a solution or even recognise one when it came along? But the fact was that I knew that there were people that had learned to overcome their anxiety so therefore if they could do it I could do it to. It was these realisations that set me on a journey that changed my life and gave me back control of my mind. Once I changed how I viewed my anxiety I was open to learning how to overcome it. Now I help others that suffer from anxiety, stress or depression to take back control of their mind and as a result live lives of happiness and fulfillment.